Students rehearse for their upcoming opera performance. Photo by Mason Lovett. While the Butler Opera Theatre performs every year, this time is a bit different. The performance will be entirely sung in English, making it a bit easier for the audience to follow along. The show will also be fully staged, meaning that students will perform in full costume with sets and props. The show, which is directed by Oliver Worthington and conducted by James Caraher, features both undergraduate and graduate vocal performance majors. Many of the students involved are looking forward to the changes being incorporated into this year’s show. Avery Schott, a junior vocal performance and peace and conflict studies major, said he thinks the use of costumes and sets will enhance the audience’s experience. While previous performances have featured some sets or props, audience members were still required to use a certain degree of imagination to fill in the gaps. 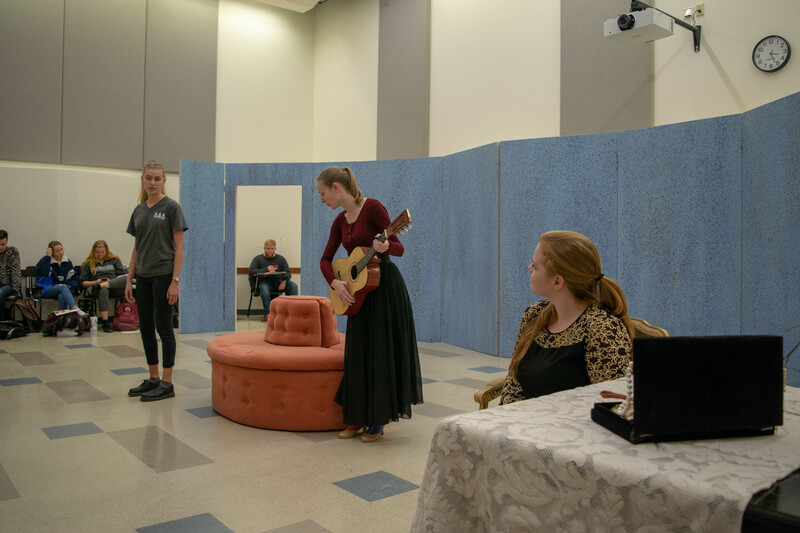 Bailey Gordon, a junior vocal performance and recording industry studies major, agreed a fully staged show would make it easier for audience members to understand the context of a scene. In addition to making the show more visually engaging, the Opera program is also making the show more accessible to audiences by performing only in English. Traditionally, operas are sung in the language in which they were written — typically Italian, German or French. Scott encourages students who may have previously avoided opera to give the show a try. Being able to understand the words themselves may make the show less intimidating. Gwen Sell, a junior vocal performance major, thinks the decision to perform in English is a strategic to make opera, an art form sometimes considered elitist, more accessible to modern day audiences. In addition to musical theatre pieces, the show includes a variety of genres, from comedies to tragedies. It also features a variety of well known and lesser known operas. One of the operas being performed in part is “Don Giovanni,” possibly the most famous opera of all time. It was written by Mozart, and is a timeless story of schemes, lovers, and betrayal. In contrast, excerpts from more contemporary productions such as “The Light in the Piazza” are also being performed. This is a musical created in 2003 by Adam Guettel and tells the story of a mother and her developmentally disabled daughter in Italy for a summer. Alana Jones, a graduate student in vocal performance, thinks the diversity in scenes will be educational and beneficial to viewers whether they know anything about opera or not. While they’re relaxing, Julie Query, another graduate student in vocal performance, also hopes the audience will be a little amazed. Tickets for Butler Opera Theatre’s Scenes and Arias are $7.50 for students and $15 for general admission. Tickets can be purchased at butlerartscenter.org.